Sometimes all you want to do is press play on a magical big red button and hear the music you like. That one-touch startup has never been done as simply as has been in Nokia Music's overhauled Windows Phone app, MixRadio. You turn it on, and it plays a station that's perfectly tailored to all the data you've ever given them. 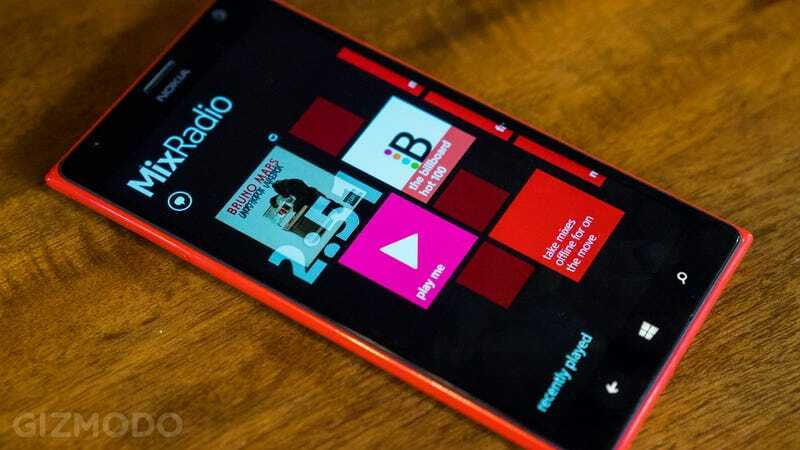 Nokia Music is one of the many software perks that comes with owning a Lumia Windows Phone. If you have the phone, you have the service, which is basically a streaming radio app that doubles as an iTunes like hub for music you load on from your computer. You can either play your music or listen to generated "mixes" based on artists you like. The most intriguing addition is big square "Play Me" button you see immediately upon opening the app. Fire up the app, hit the button and it'll launch an automatic playlist tailored to your "Taste Profile." In the past I've told Nokia Music a bunch about my music listening tastes, and so when I push play, I don't need to enter an artist, I don't need to pick a mood. I don't need to pick anything at all. It's not a specific station I've made before, but a new one generated in that moment based on everything Nokia knows about me. It's one step closer to the the big red button that launches the All Knowing Music Service. Except that in this case, the button happens to be pink. Though Nokia is using some of its own secret sauce and data, the underlying tech is at work here is an implementation of the The Echo Nest's taste profiling system that was launched on Rdio over the summer. On Rdio it's called "Me.fm" on MixRadio, it's called "Play Me," but the products are pretty similar. But not even Rdio can match interface simplicity of PlayMe. From your homescreen, you're two taps from completely automated music. Nokia's VP for Entertainment attributes this to the fact that Nokia Music is "genetically mobile." The company built the product for smartphones, whereas other services are born on desktops and only later migrate to handsets. When you're on the move, you've got limited attention to spare for staring at your phone, which is why mobile apps for the most part try to to keep it simple. Play Me is designed for situations when you don't want to stop and stare at your phone. The big pink button that autoplays perfection doesn't exist yet, but Nokia Music execs make a convincing case that its mobile DNA could give it an edge. You see, right now, the product might not seem all that exciting a casual Pandora user. When you open up Pandora, it just plays, too, right? Nokia's music chief Michael Bebel points out that, yes, Nokia's Taste Profiles now are just the sum of how you rate different songs. But it doesn't have to be that way. The key is your phone, which is basically a huge sensor with the power to give Nokia troves of contextual data that it can use to better understand you. In fact, Nokia Music is already collecting and studying anonymized location and time data for future products. Beyond "Mario likes the Smiths but not The Fall" the playback algorithms will one day know that you're at the gym and that means that you want metal—the angry stuff. Nokia MixRadio is live right now in the Windows Phone store.